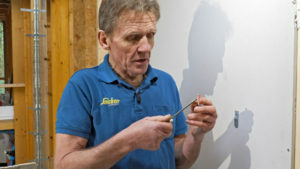 Roger Bisby checks out a range of fixing solutions. With so many stud walls, not to mention dot and dab, the challenge of getting a good fixing is ever present. Nearly all plasterboard fixings claim to have superior holding power. Some will tell you they support up to 180kg, but that is a straight down pull and not a cantilever. Whatever manufacturers may claim the pull out on a plasterboard fixing is determined by the strength of the board. Having a large surface area is obviously going to spread the load, but we are still talking about an inherently weak material – which gets weaker when it gets damp. It is, therefore, up to the tradesperson to assess the situation and decide whether a fixing is suitable. As with all fixings you really need to be operating at half the safe working load. No matter how strong the fixing there are situations where a plasterboard fixing is simply not good enough. If you are hanging a boiler then plasterboard fixings are, in my opinion, not good enough, because failure would not just be embarrassing but catastrophic and, importantly, no manufacturer is going to pick up the bill for damages. In other situations, such as hanging radiators, which can easily weigh more, I would be prepared to rely on metal fixings, because the force tends to be straight down and the load is spread across a larger area, but wherever possible I would still be looking for a timber stud. DeWalt has got into fixings in a big way these days and has settable anchors, and a setting tool, as part of its comprehensive range. It would be hard for them to claim that they are better than companies such as Rawlplug but they are certainly every bit as good. Having said that, the dedicated DeWalt setting tool is a non-ratchet tool, which brings nothing to the party, so if you have a setting tool with a ratchet you might as well use that. These toggle fixings have been around for many years under the Toggler brand, but DeWalt is now marketing its variation. 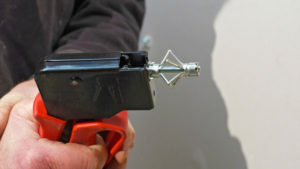 The metal anchor has a sharp end to allow you to wind them in through the board without a drill. The fixing is designed for use with a bolt (not supplied) and this threads through the rear anchor to make a metal to metal fixing suitable for electric consumer units and switch boxes. The plastic strap is there to draw the rear toggle to the wall, but the pressure is applied by tightening the bolt. These fixings are colour coded for use on single or double skinned board. 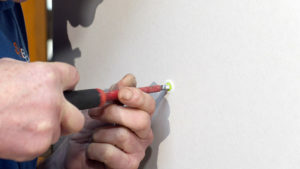 The middle part of the fixing is made of a softer nylon designed to knot up behind the board. The tip is a harder plastic to take a screw thread. Unlike metal, or hard plastic, this material does not damage the board, and the fixings can be easily removed. The plug is driven in and tightened with a T25 Torx drive (bit included). The blue type is ideal for single skin plasterboard applications and can hold loads up to 38kg. The red type is ideal for double skin plasterboard applications and can hold loads up to 70kg. (loads are for dry plasterboard with a minimum of 300mm spacing). The Fischer DuoTec has become a popular fixing among the trades. In one position it is a self-expanding screw with plenty of grip, even in difficult materials such as soft block but the strap also allows you to push it through plasterboard as a toggle fixing. The great thing about this is the screw is held in a pair of metal teeth so it is not relying on the plastic as a self-tapped thread. Once the thread is grabbed by the metal teeth it is a very firm fixing. GripIt is best known for winning an investment from Dragons’ Den for is range of plasterboard fixings. 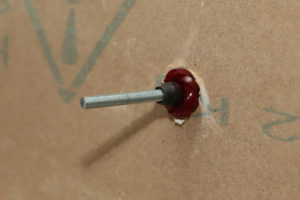 Those require a hole saw to set into the plasterboard and, to be honest, they are a bit of a Marmite product with the trades, but this self-drilling worm screw plug is another item entirely. It is similar to many others on the market, except for one important innovation. The Pozidive centre is a kind of clutch mechanism that stops you over-tightening and stripping the fixing out. Once it reaches the correct torque the centre just spins. From then on it works in the same way as other fixings of this type.